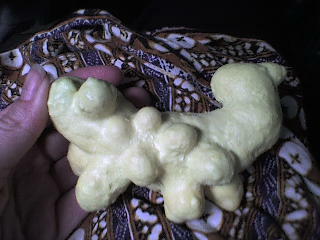 Cancer Snail is made of sulfur. We bought him for 50 cents from one of the miners at Ijen, who assured us he was a snail even though he has no shell or other snail-like features. We immediately named him Cancer Snail because of the tumor-like lumps that cover his body. Cancer Snail cannot walk or even stand on his own. Still, he is an inspiration to millions. He has traveled the length of Java and Bali, and faces each day with the same cheery yellow countenance. Schoolchildren flock from miles around to see him (well, not exactly, but we think they will someday). I believe we can all learn from the example of Cancer Snail. The reason people stay at Margo Utomo, besides the enormous bat and the nutmeg, is that it makes a good staging area for a hike to the Ijen Plateau. 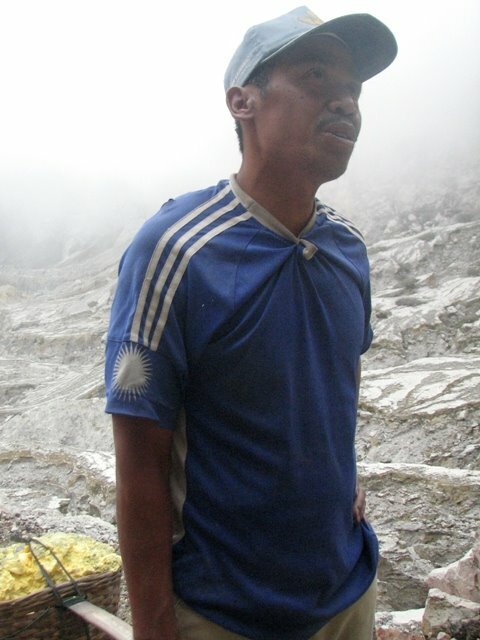 And Ijen is one of the most amazing places I’ve ever seen. 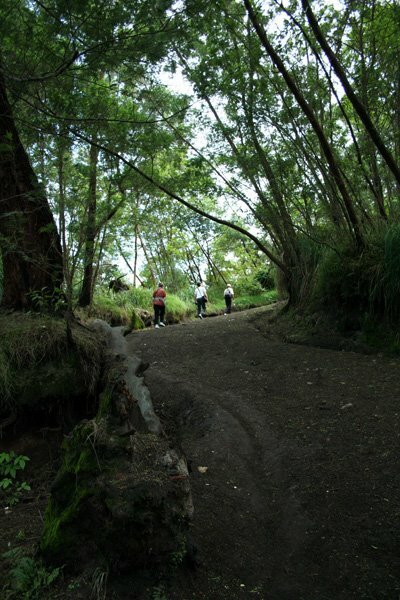 The path up is quite pleasant, with pretty views of the surrounding mountains. But once you get above treeline, you’re suddenly standing on the surface of the moon. It’s all exposed, striated rock surrounding a smoking crater and an unnaturally bright-aqua lake. 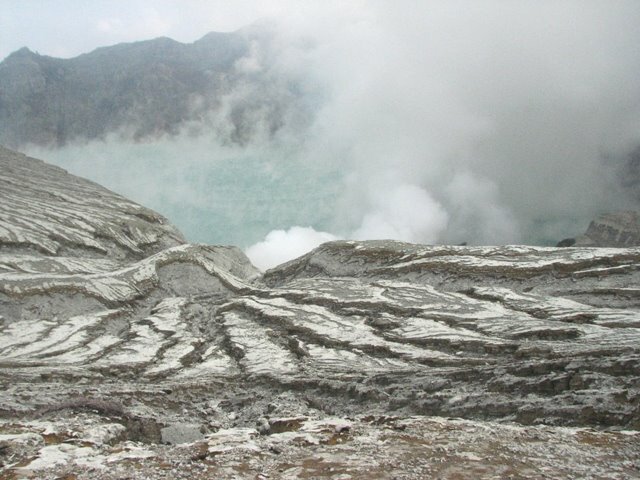 The crater spews clouds of yellow sulfur gas. Sulfur collects all around the crater mouth, and local people chip out chunks of it and carry it 5 miles down the mountain to sell. 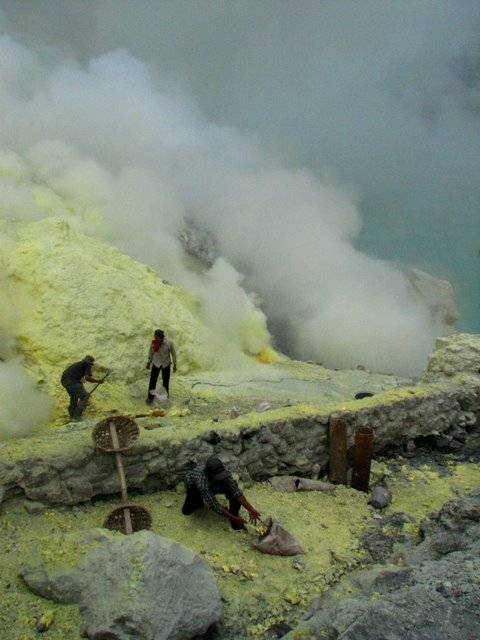 The baskets full of sulfur often weigh more than 100 pounds (45 kg). The miners typically finish two trips per day, for which they get paid around $7. Chad and I went into the crater to do some interviews. Here, as opposed to Mt. Bromo, we got very lucky with the wind direction. When we arrived it was blowing the sulfur right up the trail, but as we began to descend into the crater it shifted to the side. Still, the mine was like some medieval portrait of hell. It was hot; the men did backbreaking labor, using long, metal-tipped poles to dislodge chunks of sulfur; every time the wind shifted and blew a cloud of gas over them, they were seized with spasms of coughing. Each man generally works two weeks on and two weeks off; you can’t do this job full-time because your knees and lungs can’t handle it. As it is, the miners have multiple health problems and tend to die younger than their counterparts with easier jobs. Ask them why they do it, and you get a simple answer: for their kids. School costs money here, and any responsible parent is focused on getting his or her children educated. $7 clearly isn’t much, but it’s way more than you can make farming. This guy has a grown son in the Navy. He was proud, and justifiably so, but he was still laboring away because he has more children to raise. 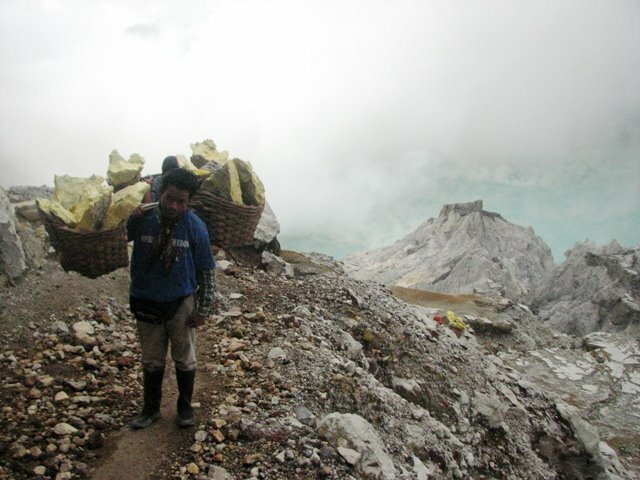 The New York Times has a pretty cool slideshow of Ijen here. 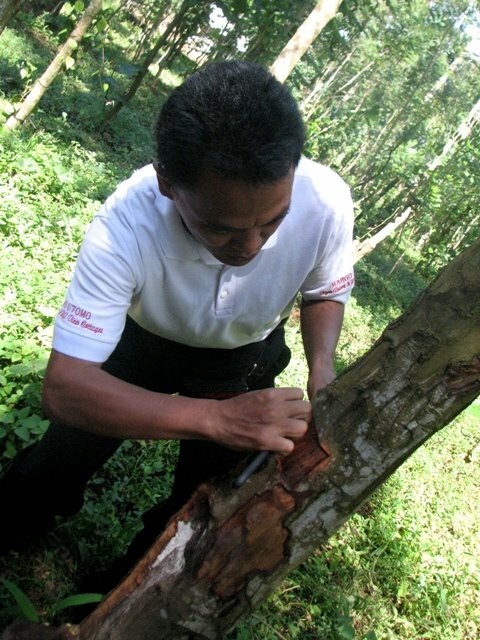 The Margo Utomo plantation has an excellent tour, during which they teach you about the origins of all sorts of spices. Cinnamon, for example, is a tree bark — our guide peeled some right off the tree. Nutmeg is particularly surprising. It’s actually a fruit — a tart, nutmeggy fruit. Inside is a seed covered by a beautiful, lacy red husk. 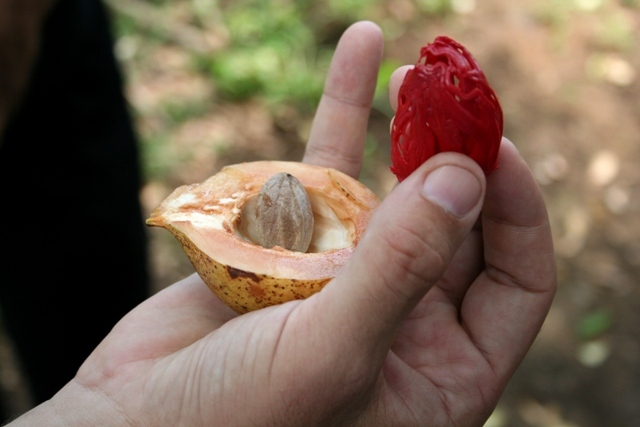 The husk is ground to make mace; the seed itself is what becomes nutmeg powder. 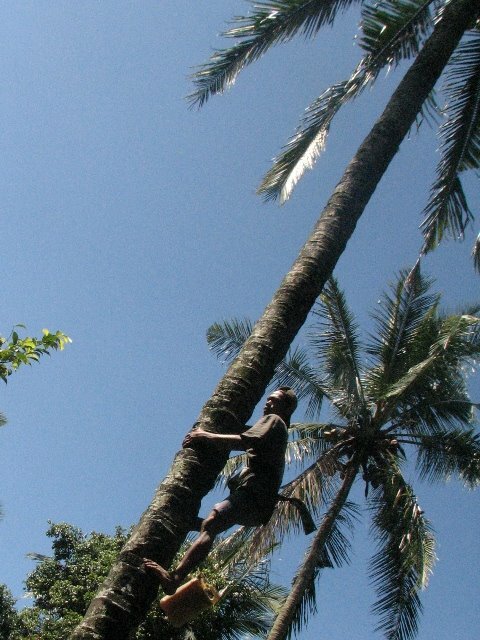 While we were admiring the nutmeg, the palm sap collecter came around and started climbing a nearby palm tree. There are notches cut on either side of the trunk for footholds. 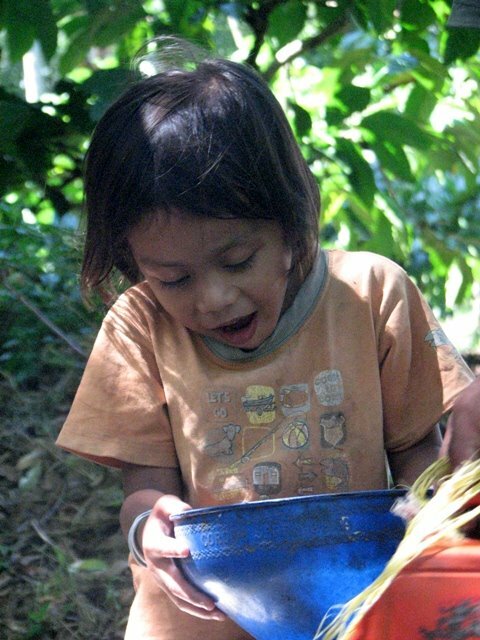 To make palm sugar, you collect the sap from the palm buds. Then you boil it down into a sort of sweet brown hockey puck. 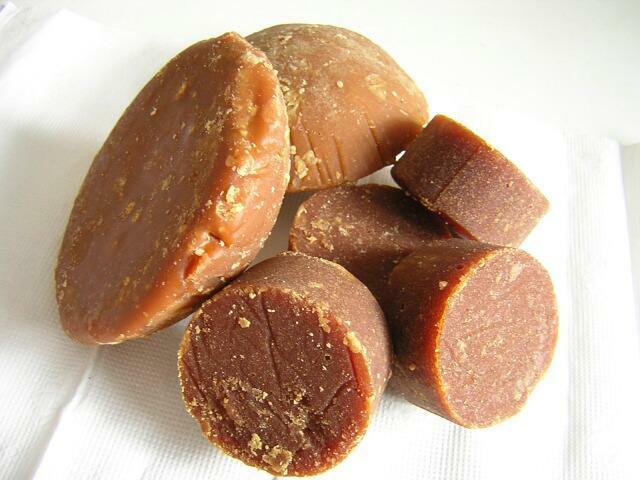 Palm sugar has a nice, rich caramel-y flavor that’s key to certain Indonesian sweets. The tree-climber’s daughter helped him pour the sap into the waiting jugs. She liked it when the last of the sap gurgled down through the funnel. My apologies for the USA Today travel blob that now appears under the Archive section to the right … as part of my job, I’m trying out a bunch of different web toys. And who knows? Maybe you’ll spot some cheap tickets to Jakarta and decide to come visit! 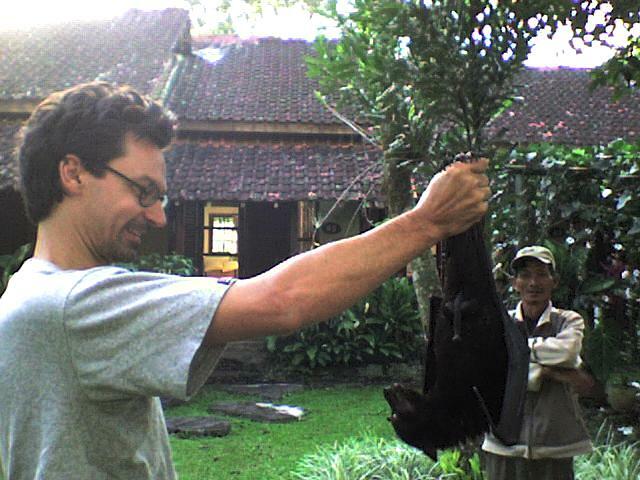 Every morning when we walked out of our room at Margo Utomo, we were greeted by the sight of a large fruit bat. 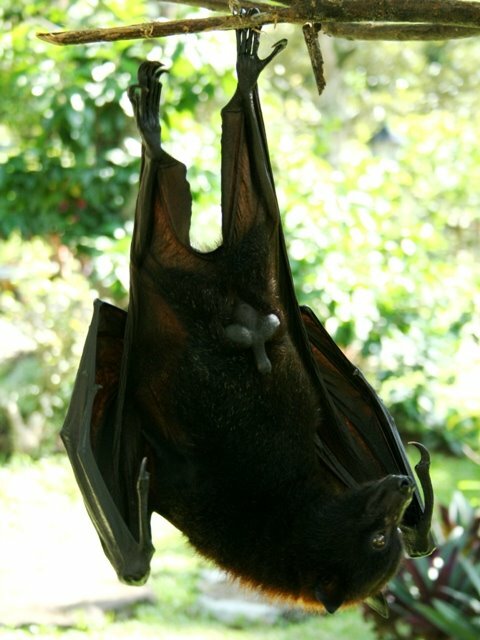 The bat is a permanent resident of the plantation. He (as you can see for yourself, he is clearly a he) spends most of his day in a bamboo cage, but in the morning his caretaker feeds him at this tree. On our first morning we spent a long time admiring the bat. He entertained us by eating chunks of papaya and pineapple, walking hand-over-hand along the branch, and unfurling his beautiful leathery wings. Eventually the caretaker offered to let us hold him. Chad was the only one bold enough to accept. The bat has a sad story. He was taken from his mother as an infant, so he never learned to fly. He has probably never know the society of other bats. He’s dependent on his keeper for even the small luxury of enjoying a tree branch. On the other hand, he’s well-fed and well-kept and, unlike some of his fellow bats, he has not wound up on anyone’s dinner plate. 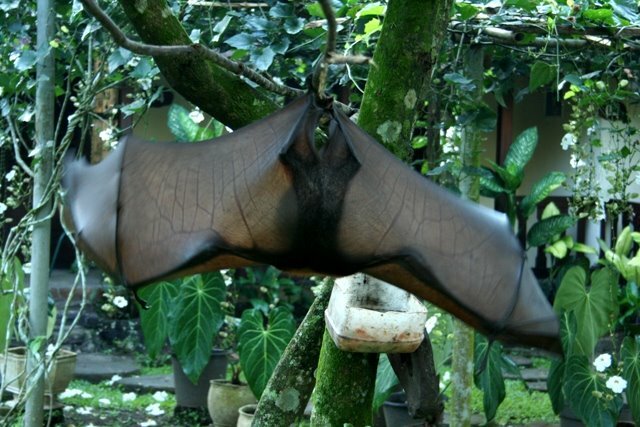 Fruit bats are eaten in some parts of Indonesia, most famously in Manado. I suppose luck, good or bad, is always a relative thing. Our first day at Margo Utomo, I had to finish writing a story, so I stayed behind when everyone else went out on a plantation tour. I was done by noon so I rewarded myself with a walk to town to look for lunch. And that’s where I had one of the world’s great chili sauces. 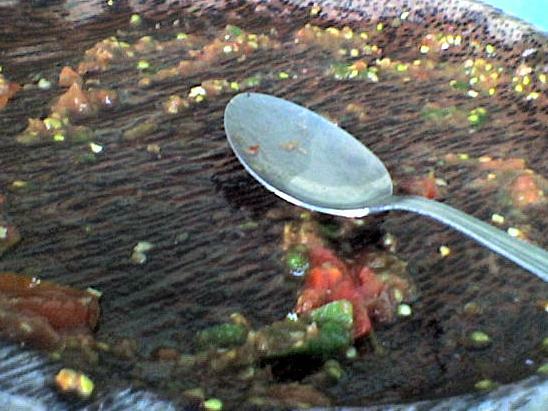 As far as I could tell, it was just perfectly ripe chilis and perfectly ripe tomatoes, crushed in a mortar and pestle. Maybe a little salt. What else do you need? The woman who ran the restaurant would make a small batch every time someone came in. She brought it out right in the shallow wooden bowl where she’d just pounded it. It was a little roadside restaurant, and in the usual fashion there were about half a dozen bowls sitting on the counter, shielded by plastic covers to keep the flies out. You could ladle yourself some rice from the rice cooker and then take as much or little of anything as you wanted. 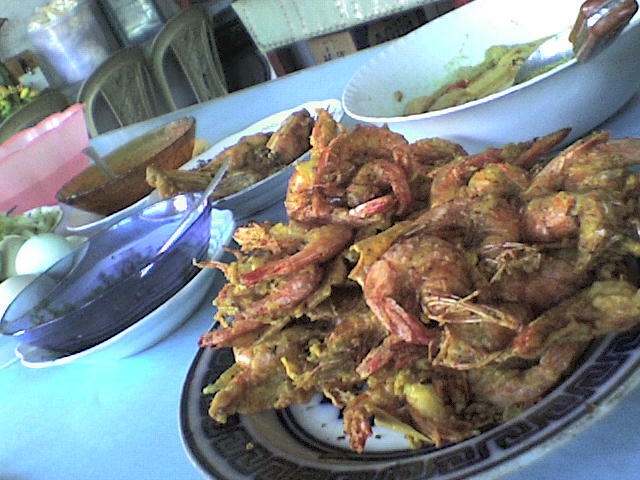 They had a very tasty curried vegetable dish with unripe jackfruit, and I never even got around to sampling the mountain of fried shrimp. I left wondering how many other amazing chili sauces were lurking in humble eateries in Kalibaru. 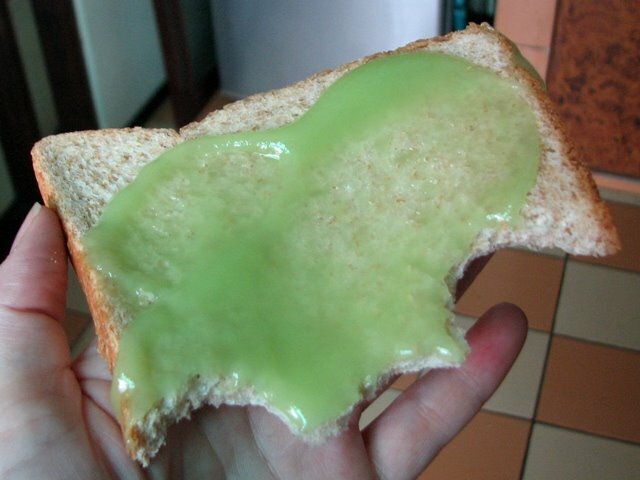 Green goo is actually srikaya jam, a custardy sort of spread made from coconut milk and egg. 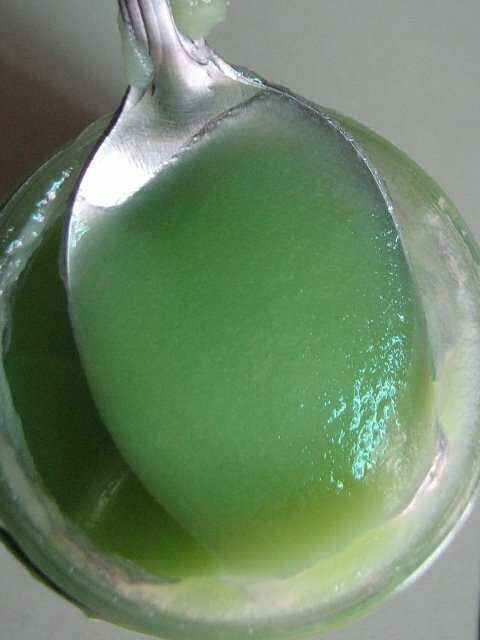 The color comes from pandan (also known as screwpine) leaf , a favorite dessert flavoring in Southeast Asia. 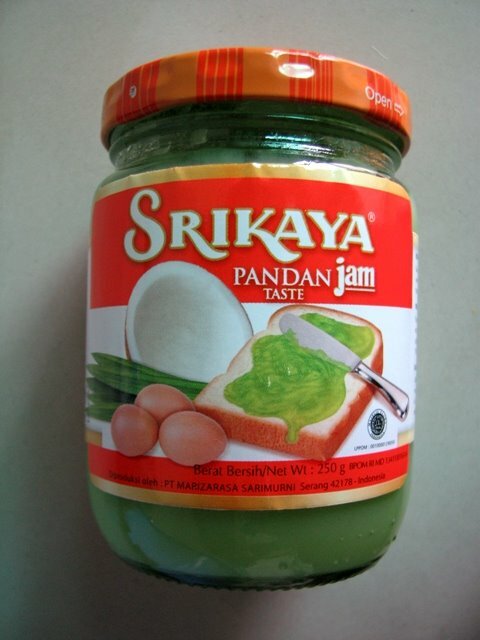 Pandan jam is thick, rich and sweet and pretty much tastes like coconut cream pie. If you put it on a piece of bread, as the drawing on the label suggests, you have an open-faced coconut cream pie sandwich. That’s probably somebody’s idea of the perfect lunch, but not mine, since I’m not a big coconut fan. I think I’ll keep the rest of the jar around, though; it might come in handy if we decide to shoot a low-budget sci-fi flick or turn our apartment into a haunted house for Halloween.